The company connected sources I spoke with downplayed the news, suggesting that Origin had always been run as a kind of consortium, with Nick Berry actively involved in all key company decisions up until now. Burkhardt, I was told, remains as the company’s Chairman of the Board. I am still attempting to learn more about just what this change means, but in the press conference I found Berry poised and compelling in the product presentation to the media. Berry’s style is quite different from Burkhardt, as you might expect – and he offered thoughtful perspective on the new models being presented. In the meantime, if you are attending the CEDIA Expo, stop by booth #3042 and see the many new models the company has introduced. Learn more about Origin Acoustics at: www.originacoustics.com. 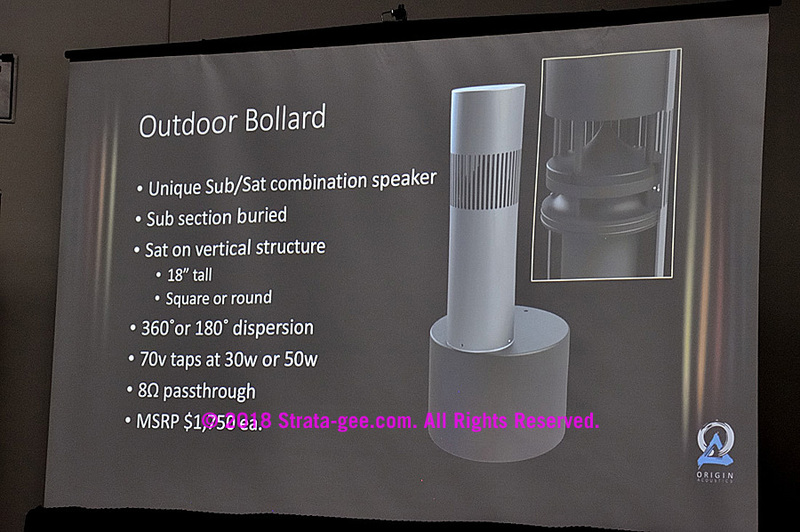 Origin’s new Outdoor Bollard line includes a buried subwoofer and a 360-degree full range speaker in a unique stand in your landscape. I don’t want to minimize this blizzard of new products. As an ex-manufacturer, I have a better appreciation than most of the media about the cost and the challenge of creating, manufacturing, marketing, and selling new products. Each new product is a huge investment, and a huge risk…and deserves our careful consideration at a minimum. But I have also been captivated by an apparent behind-the-scenes transfer of power at Origin. A few months ago, I started receiving feedback from a variety of sources that said there was a change in the management at Origin. I reached out to multiple company-connected resources to try and understand what was going on there. Specifically, I learned that the Chief Executive Officer Jeremy Burkhardt had stepped down, or had possibly otherwise been removed, and that his cousin Nick Berry, had been named the company’s new CEO. 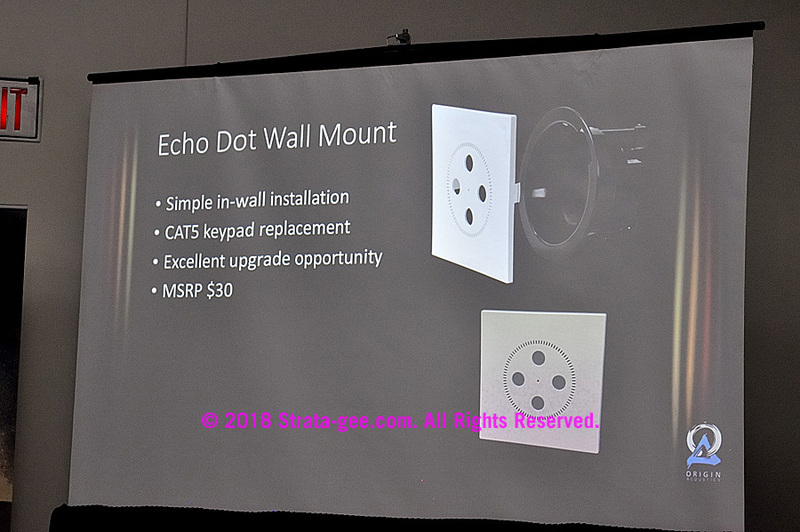 Expansion of their thin fit line of products, which are limited depth speakers that are popular globally, but especially in Europe where typical residential construction materials often limit space behind the wall or ceiling. The introduction of “rock” style landscape outdoor speakers. New subwoofers, both the SUBDD12EQ (an app controllable dual driver 12″ subwoofer), and the CSUB12 in-wall 12″ subwoofer. Origin Acoustics had their usual large volume of new model introductions including multiple products in multiple categories. 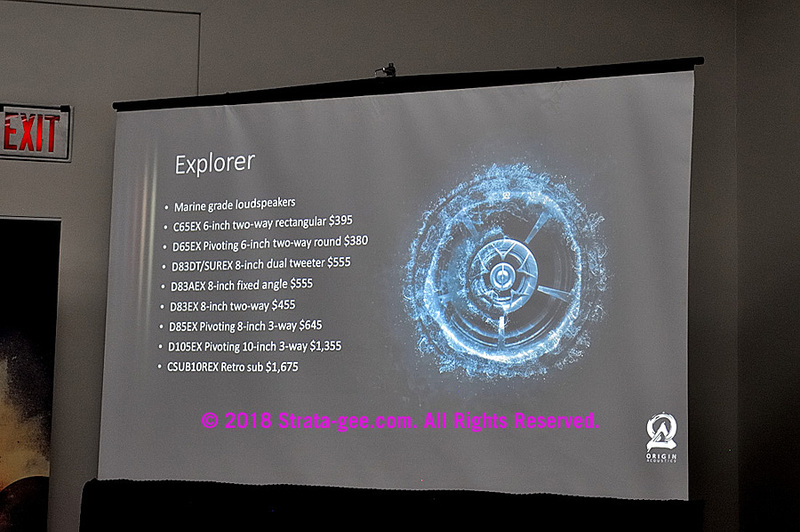 Dave Donald quickly ran thorough a slide deck presenting key products and key bullet points – making sure to keep a couple of spots in the presentation for Nick Berry, Origin’s new CEO. And as usual, Origin begins the show by putting on the Dave Donald show. Donald, who is Origin’s “Worldwide Ambassador,” is a showman at heart with a dynamic speaking style and sprinkles of exciting hyperbole. I have to say, while Donald seemed slightly lower key that at past shows, you certainly won’t drift off to sleep when he’s verbally throwing new models at you. 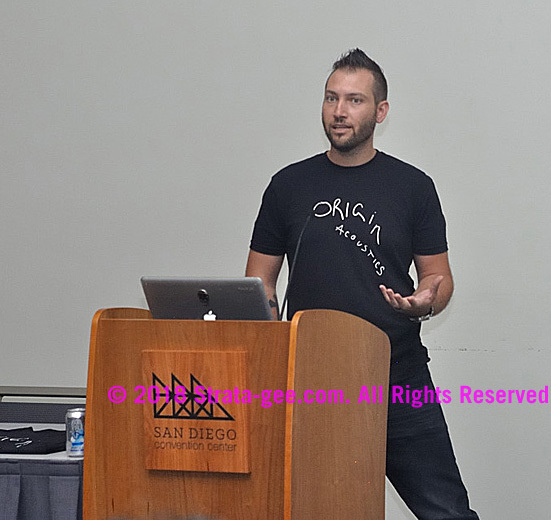 First official CEDIA Expo 2018 press conference was Origin Acoustics.